Archbishop of York John Sentamu is setting up an independent inquiry into allegations of sexual abuse made against a Church of England cleric. 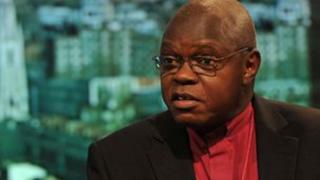 A former Archbishop of York has denied being negligent by failing to notify police when made aware of the claims. Dr Sentamu's office said the probe would look "specifically into the issues surrounding the reports" and the findings would be made public. It said child abuse allegations were treated "with the utmost seriousness". The accusations, which were brought to light by the Times newspaper earlier this week, concern alleged abuse against a schoolboy in Australia in the 1960s and a Manchester Cathedral choirboy in the 1980s. They relate to Robert Waddington, who was Dean of Manchester Cathedral from 1984 to 1990, who died in 2007. The former Archbishop of York, David Hope, was reportedly told of the Australia claims in 1999 and the other allegations four years later. He confronted Mr Waddington and banned him from conducting services, but did not call the police. The now Lord Hope - who was Archbishop of York from 1995 to 2005 - said he had acted in line with Church child protection policy of the time. He said in a statement: "I strenuously deny (and am obviously disappointed at) the suggestion that myself or my team at the time would have acted negligently in this or any other safeguarding matter." Guidance stated there was "no automatic legal obligation on the Church to refer allegations by adults to the police or social services" but has since been revised. Lord Hope added that, "in considering whether children would be at risk from Robert Waddington, I decided under these guidelines that this would not be the case given his serious ill health following cancer surgery". In announcing the independent inquiry, Dr Sentamu, stressed that the Church's first priority was the victims of clerical abuse. "The Church of England continues to review its child and safeguarding policies regularly to ensure that the Church is a safe place for all. "Child abuse is a heinous and personally damaging crime, it is therefore incumbent on the Church to treat such matters with the utmost seriousness." The Archbishop of York is the second most senior cleric in the Church of England after the Archbishop of Canterbury.